I have a question about the card 'Thoughtsteal'?? My experience playing against it leads me to believe it's two cards from my total deck of 30, because I've seen Priest wangle cards I've played all of already. Heh. Just now, I fed him his own bananas and BGH'ed his tail. Kind of a waste of good bananas, but it felt good. 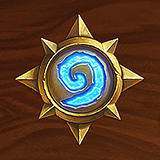 Why is Naxxramas so expensive? It was cheaper than I expected. I'm going to run out of gold before the last one, but I don't mind waiting a few days before I can build it up. Being a good sport is reciprocal. There isn't an option to say "Thanks, you too" so just "thanks" makes it sound like you're accepting the compliment without returning it.It is not, as deals go, big. I hate that. I say "Well Played" you say "Thanks" -- what, you think I'm complimenting you? I'm being a good sport.And for chrissakes, don't ever say "Sorry." That gives me heartburn. Yeah, Ragnaros is not the scariest beast in the jungle. What he usually does is crank up the RNG. Who will he hit? Do I have a Faceless or a one-card counter?I don't have him and I don't think I'd run him if I did. How do you remove RNG from a card game? How's your hearthstone day going? Root Canal or Playing against a Priest? I routinely play to fatigue against Priest. And my flipping legendaries are bricks in my hand.I played one last night, he got all the way through his deck, and it turns out he didn't have a single Mind Control. I'd been sitting on Tirion Fordring for ages for fear of having him pinched. I won, but not by much.